Impact analysis of fiscal incentive schemes supporting film and audiovisual production in Europe has just been published by the European Audiovisual Observatory (motto: "Transparency through information"). This report addresses the issues surrounding the impact of fiscal incentives currently operating in Europe, taking a comparative approach, analysing schemes from the individual perspectives of the national markets in which they operate, and evaluating their impact at a pan-European level. · Have incentives influenced the production levels, employment prospects, and direct funding systems within their own countries? · What is the impact of fiscal incentive structures on neighbouring countries through production flows and movement of employment? · Have incentives altered the business model for European independent production companies? · What is the fiscal impact for the States offering such incentives? - Recommendations on future assessment of fiscal incentive schemes in Europe. As part of this analysis, the report looks in greater detail at eight selected schemes presently operating in Europe. You can get further details of this publication here. If any reader is going to be reading and using this title and would like to let IP Finance have a short review, that would be greatly appreciated. 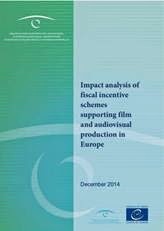 The European Audiovisual Observatory publishes a new analysis of the impact of fiscal incentive schemes – tax shelters, tax rebates and tax credits - which aim at stimulating investment in the production of film and audiovisual works. The analysis identifies, describes and categorises the schemes in place across Europe and evaluates their impact in attracting foreign investment, both from within Europe and from other countries too. It then compares the various schemes according to their advantages/disadvantages and examines how they work alongside other economic and political measures. The report concludes by evaluating the impact of these systems in the international context. Key questions addressed by this report This report addresses the issues surrounding the impact of fiscal incentives currently operating in Europe, taking a comparative approach, analysing schemes from the individual perspectives of the national markets in which they operate, and evaluating their impact at a pan-European level. In doing this, the report considers: The landscape for fiscal incentives targeting film, television, and video game production, including where they operate and what structures they use (Chapters 5 and 6); What trends exist within the European fiscal incentive system (Chapter 7); The impact, in particular the economic impact, of fiscal incentive schemes (Chapter 8), including questions such as Have incentives influenced the production levels, employment prospects, and direct funding systems within their own countries? What is the impact of fiscal incentive structures on neighbouring countries through production flows and movement of employment? Have incentives altered the business model for European independent production companies? What is the fiscal impact for the States offering such incentives? How such incentives have been evaluated by the countries in which they operate, and how the conclusions of these evaluations compare with one another (Chapter 9); Recommendations on future assessment of fiscal incentive schemes in Europe (Chapter 10). As part of this analysis, SPI have looked in greater detail at eight selected schemes presently operating in Europe where the most substantial amount of comparative data is available; these schemes are more fully described in an Annex, chapters 11 to 18. As well as the direct impact on the film and audiovisual industries, it is possible to look at the indirect impacts on output and employment – arising from the industries' supply chain – and the induced impacts – arising from those directly and indirectly employed in these industries using their earnings to buy other goods and services. The indirect and induced impacts can be described as the film industry multiplier – the ratio of the total economic impact of the film industry to the direct impact. This analysis was carried out by one of Europe’s leading screen sector development consultancies, Olsberg•SPI, providing specialist, high level advice for over 20 years to public and private sector clients in the creative industries, focusing on film, television and digital media.